I wonder if Phillip and Sally are still together? Urgh just read through this and now I have THAT mental image in my head! Why did they have an affair in the first place? If A was married? Brain bleech, brain bleech!! Curse you, lively imagination!! I think not, Sally seems a bit too down to earth to cope with obsessive Anderson. Sometimes I wonder how those two could ever end up having an affair.. but then again, I don´t really want to know or think about it. Gosh, I do like that line as it always cracks me up... but I don't really want to know more... and no; I don't think they're still together. I bet Anderson got too freaky for her. Yeah, she probably went, "You love the freak now?" I have to say that, as much as there is that I don't like about this Sherlock, he has 1) stopped Moriarty, 2) pulled off faking his death, 3) stopped the destruction of Parliament, 4) brought down CAM...I would think Scotland Yard and/or the British Government would be going, "Oh, we're so sorry we treated you so badly." And we see some of that with Anderson. But no sign of it with Donovan? We didn't see much of her this series. What don't you like about Sherlock? Maybe she likes playing dress up. She put on a cute litte retro apron with piping and appliqued pockets and gave that poor bloke's flat a good cleaning. Not everything is about s -e -x you know. Sherlock's implication is quite clear. You really need to join the diplomatic corps! I like Sally. She's an underrated character. She takes Sherlock's insults and keeps doing the job. 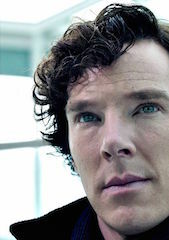 One of the reasons Sherlock is such a fine series is that the characters are ambiguous. "Good" characters do repulsive, tasteless, bad things. I admire Sally's toughness for not caving. Sherlock is pushing his boundaries with her, and she's not playing. That's the only way to deal with some people. The tai chi approach. Her behaviour towards Sherlock is outrageous. besleybean, we don't seem to communicate well. I mean you no disrespect but I disagree with you. So I'll just stand aside. You don't have to stand aside at all, we are allowed to disagree. I think Sally is one of those hard edged button up types on the job and an absolute freak in the sheets. It just kills her that Sherlock can see right through her. tonnarree - Well stated. I feel the same way, hence my comments about Sally playing dress-up with her colleague.